With the release of Windows 8.1 Update Microsoft has introduced a new feature Internet Explorer Enterprise Mode. 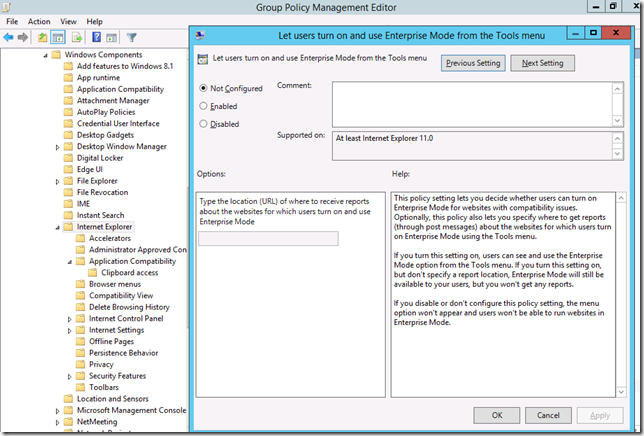 This allows admins to assign via Group Policy a way to force web site to render using specific browser modes. Internet Explorer has has a long heritage and each new version of the browser shipped has had the rendering engine of the previous installed for compatibility. This option can be invoked by a user by pressing the F12 and then selecting the Document Mode they want to render the page with (see below). The problem is how IE determine what browsing mode the browser mode should use (See http://blogs.msdn.com/b/ie/archive/2010/03/02/how-ie8-determines-document-mode.aspx) is never an exacting science and it sometimes gets it wrong. To help address this performance issue and to make it easier for enterprise view internal website using newer rendering engines Microsoft has introduced an new option call Internet Explore Enterprise Mode. This gives administrators more configuration power over what web sites are configured using older and newer rendering engines. Internet Explorer Enterprise mode is not visible to the users out of the box. 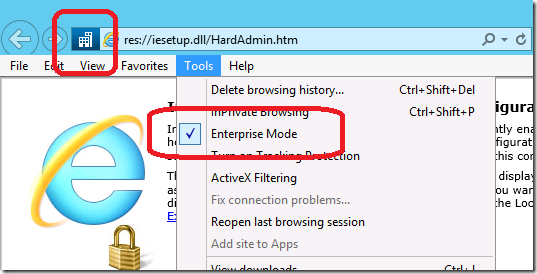 To enable this feature you need to enable the “Let users turn on and use Enterprise Mode from the Tools menu”. 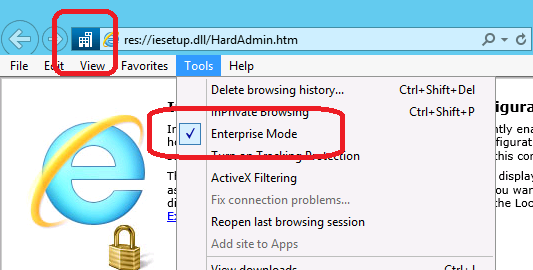 Once enabled user can toggle the “Enterprise Mode” option from the Internet Explorer menu. 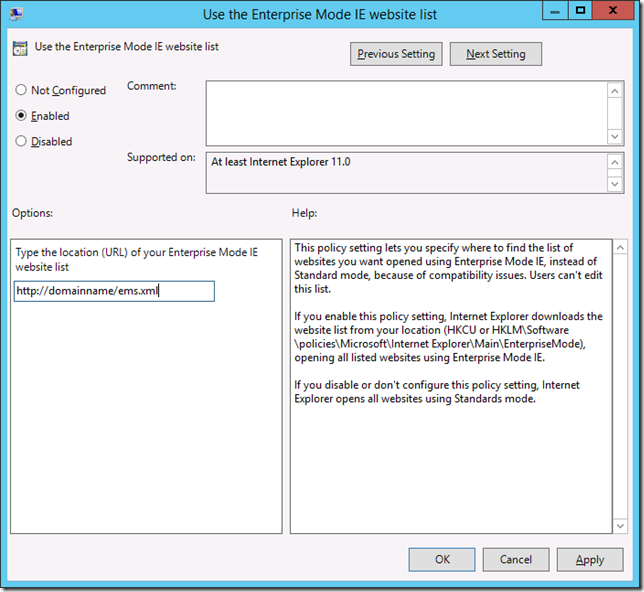 But if the organisation want to specify the location of the Enterprise Mode IE List you can specify the path via the “Use the Enterprise Mode IE website list” group policy. The URL that you specify in the above mentioned setting is an XML tool called the Enterprise Mode Site List Manager (not yet available). This tool will allow you to create you own custom corporate XML file that allow you to granularly specify what web site to render in IE Enterprise Mode. Once you save the file you publish it to the URL configured via Group Policy and the user will pull down the updated compatibility view list. Correction: If you have downloading the EMSL tool you can use a text file to bulk import sites in the tool to generate the XML file. As the tools is not out yet you still need to hand craft the XML file. Any idea how often IE actually refreshes the list from the source? I’d like to know what sort of delay to expect between adding a site to the list and a client actually knowing about it. I read somewhere that IE checks on initial start (30 seconds within start?) and a user just has to restart IE to again check for the lists. I would think the refresh will be dependent upon how often the gpo updates. Also if group policy updated the client but an older browser session was running it may have to be closed and re-opened. All those RT “comments” are so annoying. You don’t mention where the setting lives, I assume it’s a user policy since you show HKCU in the reg shot. And you must need some new IE11 admx files loaded, I can’t see the polices, I’ve tried just adding reg settings in HKCU and HKLM (other pages mention HKLM http://blogs.msdn.com/b/ie/archive/2014/04/02/stay-up-to-date-with-enterprise-mode-for-internet-explorer-11.aspx) but I can’t get the Enterprise Mode menu to appear. I can’t agree with you more !! In oreder to see the Enterprise mode menu . this just seems kind of hacky. it requires a specific tool? i assume this is to extract the administration of this list away from the group policy administrator role. if you update the list manually (or use some automated script or service to update it) you also have to manually update the version number at the top of the file. otherwise clients won’t use your updated list. it’s less than smooth. 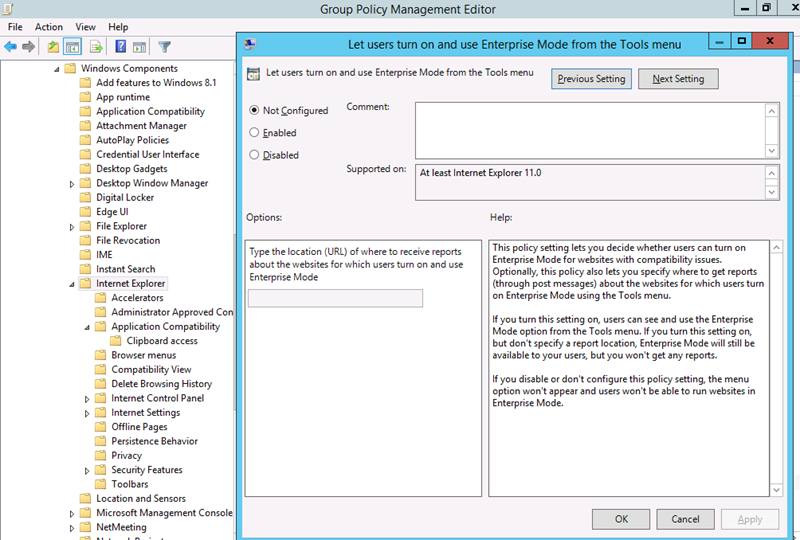 also, if I put a site in enterprise mode via in group policy, why does the user still have the ability to uncheck ‘enterprise mode’ for that site in his tools menu? I would not call this solution a hack as this does not require any specific tool. This is native functionality of IE and is configuration via Group Policy. It pull the configuration file and yes the version number needs to be changed and you can use Enterprise Mode Site List Manage that makes changing the file a lot easier. As soon as you specify a Enterprise Mode Site List file then then the user gets an arbitrary list of sites. In this case you can have a group of users that have the ability to select and choose (presumably the clever users) and the reset of the population just gets what ever is dictated by the XML list. 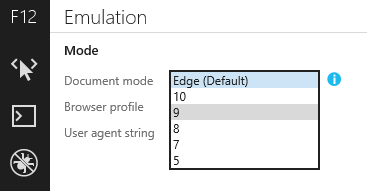 if I am using ie 11 and go into enterprise mode I can use emulation to select 5,7,8, or edge. 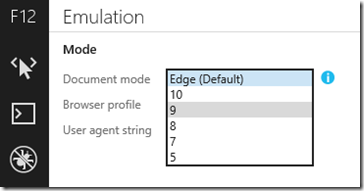 Why when using the site manager tool can I only select ie 8 enterprise and ie 7 enterprise? What is the method that I should use if I want to add mysite.com/path to be enterprise mod with doc mode 5? 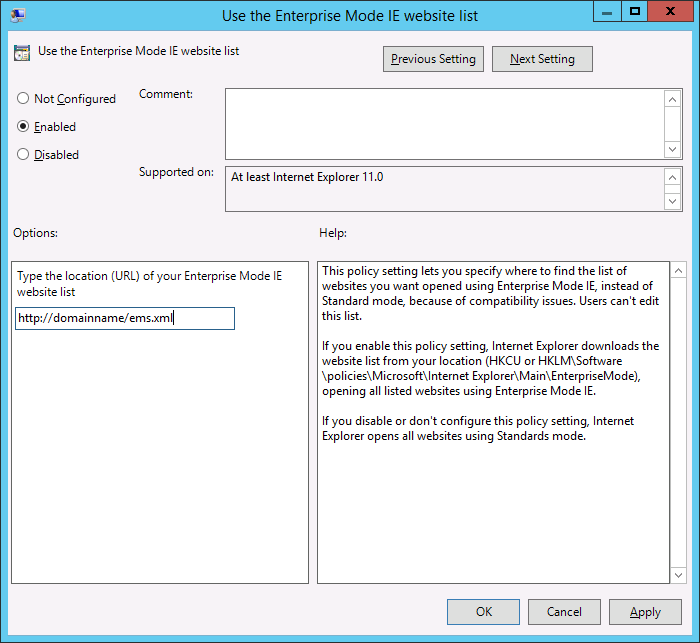 If I enable Enterprise Mode, should I disable the ability of the users to enable Compatibility View within IE11? I would not disable the ability. We give our users the possibility to set websites in compability mode themselves.